1 Mbyte of FLASH memory for the Operating System. 2 Mbytes battery-backed SRAM for CPU usage, program storage, and data storage. Data is stored in a table format. Storage capacity can be increased by using a CompactFlash® card. 12 Vdc source; SI-5 typically uses a sealed rechargeable battery that can be float-charged with a solar panel or ac power. The onboard, BASIC-like programming language supports data processing and analysis routines. An intuitive GUI is provided for user interface. Analog Inputs: Eight differential (16 single-ended) channels measure voltage levels. Resolution on the most sensitive range is 0.67 µV. Pulse counters: Two pulse channels can count pulses from high level (5 V square wave), switch closure, or low level ac signals. Switched voltage excitations: Three outputs provide precision excitation voltages for resistive bridge measurements. Digital I/O ports: Eight ports are provided for frequency measurements, digital control, and triggering. Three of these ports can also be used to measure SDM devices. 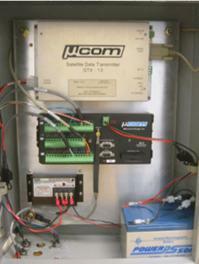 Switched 12 Volt: This terminal provides unregulated 12 V that can be switched on and off under program control. RS-232 port: A PC or laptop can be connected to this 9-pin port via an RS-232 cable. I/O port: Data transfer peripherals that require power from the datalogger can be connected to this port via a cable. Peripheral Port: One 40-pin port interfaces with the CompactFlash® module. Operational Temperature: -25° to +50°C; an extended range of -55° to +85°C is available. Compatible telecommunication options include Ethernet, phone modems (land-line and cellular), radios, short haul modems, GTX-1.0 GOES satellite transmitter, and multidrop modems. Real-time and historical data can be displayed on-site using a Palm OS-based PDA (requires PConnect 3.1), or a PC. The PC connects to the SI-5 via an RS-232 cable, or if optical isolation is required, via the I/O port and SC32B interface. Customers can transport programs/data to a PC via CompactFlash® cards. Synchronous Devices for Measurement (SDMs) are addressable peripherals that expand the SI-5’s measurement and control capabilities. For example, SDMs are available to add control ports, analog outputs, pulse count channels, interval timers, or even a CANbus interface to a system. Multiple SDMs, in any combination, can be connected to one SI-5 datalogger. Multiplexers increase the number of sensors that can be measured by a SI-5 by sequentially connecting each sensor to the datalogger. Several multiplexers can be controlled by a single SI-5. The SI-5 is compatible with the AM16/32 and AM25T. 8 differential or 16 single-ended individually configured. Channel expansion provided by AM16/32 and AM25T multiplexers. INPUT VOLTAGE: ±16 Vdc max. ANALOG OUTPUTS: 3 switched voltage, active only during measurement, one at a time. RANGE & RESOLUTION: Voltage outputs programmable between ±2.5 V with 0.67 mV resolution. MEASUREMENT TYPES: The SI-5 provides ratiometric measurements of 4- and 6-wire full bridges, and 2-, 3-, and 4-wire half bridges. Precise, dual polarity excitation using any of the 3 switched voltage excitations eliminates DC errors. after input filter with 1.2 µs time constant. LOW LEVEL AC MODE: Internal ac coupling removes dc offsets up to ±0.5 V.
8 ports software selectable, as binary inputs or control outputs. C1-C8 also provide edge timing, subroutine interrupts/wake up, switch closure pulse counting, high frequency pulse counting, asynchronous communications (UART), SDI-12 communications, and SDM communications. Control ports 1, 3, 5, and 7 may be configured for SDI-12 asynchronous communications. Up to ten SDI-12 sensors are supported per port. Meets SDI-12 Standard ver 1.3 for datalogger mode. EXTERNAL BATTERIES: 12 Vdc nominal; reverse polarity protected. WARRANTY: Three years against defects in materials and workmanship. BAUD RATES: Selectable from 300 to 115.2 kbps. ASCII protocol is one start bit, one stop bit, eight data bits, and no parity.